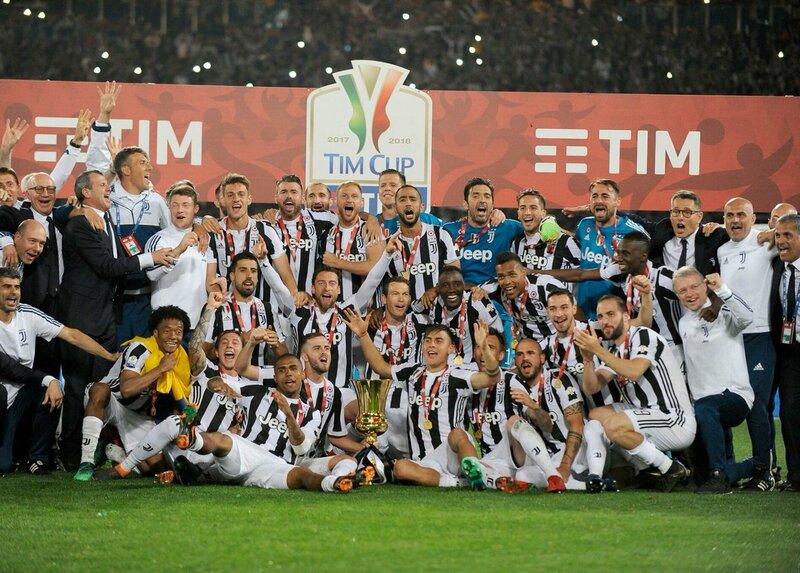 ROME: Juventus thrashed AC Milan 4-0 to win their fourth consecutive Copa Italia at Stadio Olimpico in Rome. In a highly entertaining contest Moroccan player Medhi Benatia was the unlikely hero for the Old Lady as he scored twice from corners including the opener in the 56th minute from a Dybala’s cross. Milan’s 19-year-old goalkeeper Gianluigi Donnarumma’s two faults gave Juve massive advantage at the hour mark as the Italian future keeper sent in Douglas Costa’s powerful strike before gifting an opportunity for Banatia as he dropped a Mario Mandzukic’s header into the feet of Moroccan to poke home. Nikola Kalinic then headed Miralem Pjanic’s corner past his own keeper to end a thoroughly miserable night for Gennaro Gattuso’s side. Massimiliano Allegri’s Juventus are just one point away from their final two Serie A games to complete a fourth domestic double in a row. Juve haven’t conceded a single goal in this season’s cup campaign, with Gianluigi Buffon making his first appearance in a Coppa Italia final since 1999. Milan’s young side had fought neck and neck with the experienced Juve before spectacularly falling in the error stricken second half. Allegri who is expected to leave the Italian champions at the end of the season hailed his players for the achievement. “We got the trophy, the lads had an extraordinary game and deserved this win, taking nothing away from Milan, who had a good first half,” the Coach told Rai Sport. “I had told the lads they needed to give themselves this evening after so much joy to the fans and the club. It’s right for them to celebrate, as when they work hard and enjoy their football, they’re hard to beat. “In games like this you need a little time to get into gear, but we found the passing lines, the spaces opened up and naturally the technique emerged.” The Italian added.